Akai MPK49 - "Reliable Keyboard"
Evolution Mk-449c - "I made a Keytarn from it !!!!" 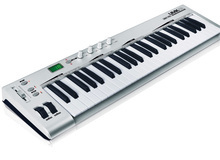 M-Audio Oxygen 49 (Silver) - "Cheap yet useful! " Line 6 Mobile Keys 49 - "Use it with your iPad too"
Novation Impulse 49 - "Had some issues with drivers"